-This stylus is rechargeable, can use and standby for a long time. -Elastic design inside, it can offer some buffers when clicking, give you a comfortable feeling when using. -Fashion design, frosting oxidized surface, it is antiskid and good for touching, and it is applied to the games, drawing, painting, etc. -This tip is high presice and is good for creation, suitable for painting and drawing. It makes the writing experience feel much more natural. -It is suitable for most touchscreen tablets and phone, and it is better for drawing instead of our fingers. -It is NOT FIT for iPad Air 2, iPad Pro 9.7", iPad Pro 12.9". -Please use the tempered glass screen protector when use the pen. -The new product should be full charged for the first time. -Starting up: Blue LED on. -Charge: Red LED is on when charging, Blue HED is on when charge complete. 【About the Stylus】Built in battery provides 12 hours of active use and recharges by Micro USB cable (included). Stand-Alone active stylus design. NO Bluetooth or APP required. And still works with any APP. It contains Active Stylus*1, Charging port cap with hanging hole*1, Charging port cap without hanging hole*1, Lanyard*1, Pen bag*1, Charging line*1. 【Precise/ Sensitivity】It has a 1.8mm super fine tip gives you the accuracy you need and provides superior control and traction against tablet screens. It is made of copper that will last for a lifetime NO WORRY ABOUT TIP WORN OUT. Active stylus technology reduces off set and lag time between fine tip and trace, providing a feel that is closer to pen and paper and extremely responsive to hand gestures. 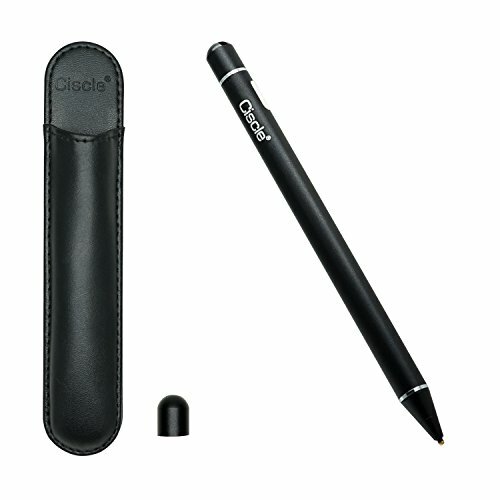 【Product Feature】There are three feature for this stylus. The tip is copper material and can provide more precise for drawing and painting, it is more durable than rubber; there is a detachable cap on the stylus bottom, which can protect the usb port from damage and dirty; there is a lanyard and a extra cap with hole which is a good way to keep your stylus with your tablet or phone at all times. 【Fashion Design】it is a sealed, solid-colored stylus. The outer covering of the stylus uses the high quality aluminum material with frosting oxidized surface, it can provide skid resistance and give you a good touch feeling when use it. And it is not lose varnish. If you have any questions about this product by Ciscle, contact us by completing and submitting the form below. If you are looking for a specif part number, please include it with your message. DotPen Pro - World's Best Rechargeable Active Stylus Pen for iPad, iPhone, and Most Android Tablets and Smartphones. Machined Aluminum Housing With 1.9mm Durable Tip.